First Line: "The boy and girl had once dreamed of ships, long ago, before they'd ever seen the True Sea." Review: The book starts off with Alina and Mal on the run but eventually they find their selves right back at the Little Palace in the middle of everything that they ran away from. I'm always weary of second books and I did have a couple of issues with it such as the angst, by the middle of the book it just all became a little too much for my likes. I loved Mal and Alina together in the last book and even though I was secretly hoping the Darkling was good deep down inside that evil heart of his it became pretty evident he is not so he is out the picture BUT then in this book we meet Sturmhond a pirate and so much more ...wow he was just one of those characters that mesmerize you from the moment you meet him and there is a very surprising discovery about who he really is which just made me love him that much more. I found myself rooting for Sturmhond instead of Mal which was mostly Mal's fault he became too ehh I don't know... with kissing another girl and behaving absolutely horrible and whiny it really turned me off, even with this I'm hoping Mal becomes the guy we met in the first book in the next book. I'm still rooting for his happy ending with Alina, although I wouldn't be mad if she ended up with Sturmhond if Mal keeps up the act he did in this book. 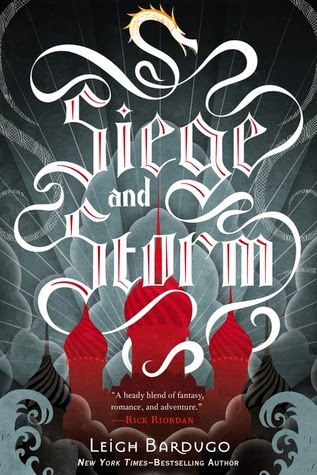 Anyways enough of the romance drama what I loved most about Siege and Storm was well everything else this book was pretty incredible. Alina found herself changing with all the power she started becoming a little darker and she sensed it. We meet alot of old faces again from the first book and there is lots of politics involved especially with Alina leading the second army and everyone thinking she is some kind of saint. Overall I enjoyed the hell out of this book I felt it was a little slower paced at some parts but still really liked it and I'm so glad I waited to read this after the final book came out because with the way things ended I would have drove myself crazy waiting for Ruin and Rising. Memorable Quotes: ~ "You were like a stranger, Alina. Beautiful," he said. "Terrible." ~"I want to kiss you," Nikolai said. "But I won’t. Not until you’re thinking of me instead of trying to forget him."